Jade Snow Wong was born on a rare snowy January day in San Francisco in 1922, and given the English name of Constance. A lifelong San Franciscan, she was the fifth of nine immigrant children. Growing up she was taught to expect a particular type of life, laid out for her by tradition and her elders. Through education, determination and hard work, Wong went beyond these traditions to pursue her passion and talent for the arts. Wong attended San Francisco City College and later Mills College, where she majored in economics and sociology. She worked as a secretary in a shipyard office during World War II, but was introduced to pottery through an art class during her last semester of college. Ceramics would become a lifelong passion. Wong worked at studios in Chinatown, Jackson Square and, most prominently, on Russian Hill. When she first began pursuing ceramics, she persuaded a Grant Avenue merchant to let her throw pots on her wheel in the shop’s front window. Fifth Chinese Daughter describes Wong’s efforts to balance her identity as an American woman with her more traditional role as a Chinese daughter in a close-knit immigrant family. The book is written in the third person, allowing Wong the opportunity to look at issues of identity from a slight distance. Critics still hail it as a pioneering work of Asian-American literature, one of the first to express the issue of multiple identities for daughters of immigrants and minority cultures. Her book was so popular that the U.S. State Department asked Wong to tour Asia in 1953. She spoke to more than 200 groups across the continent about the life of a first-generation Chinese American. She describes this trip, along with a 1972 visit to the People’s Republic of China, in her second autobiography No Chinese Stranger. 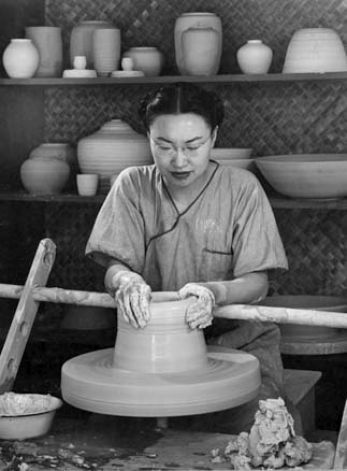 While Wong is more widely known as a writer, she also won tremendous acclaim as a ceramics artist, displaying her works at the M.H. de Young Memorial Museum, the Museum of Modern Art, the Art Institute of Chicago and New York’s Metropolitan Museum of Art, among other locations. She married fellow artist Woodrow Ong in 1950, and the pair worked together for many years, both in the arts and later managing a travel agency. Wong was an especially devoted alumna of Mills College, leading the drive to build a new alumnae center in 1945. She secured donations, hired an architect, and purchased furniture for the completed Reinhardt Alumnae House. She was awarded an honorary doctorate by Mills College in 1976. That same year, Fifth Chinese Daughter was made into a half-hour special for public television. When Wong died in 2006, she was still receiving visits and letters from fans both local and across the world, telling her how much her story of Chinese-American girlhood resonated with them.